Sometimes when people visit the historic places that once belonged to some of history’s most renowned leaders, they expect their experiences to be lighthearted. They might learn who James and Dolley Madison’s guests were at dinner, or about Thomas Jefferson’s favorite books in his extensive library. Visitors may not expect to learn much about the enslaved communities who built the homes for and ran the plantations of these revered figures. But more and more, historic sites around the U.S. are embedding their tours with knowledge about the lives of the enslaved individuals who resided there. 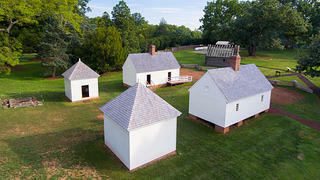 Slave cabins in Montpelier's South Yard, part of the "Mere Distinction of Colour" exhibit. It can be difficult for historic sites to strike a balance between portraying enslaved people as lacking all agency, and falling into the “happy slave” narrative that has long been associated with plantations. It’s similarly challenging to criticize popular historic figures for their choices without diminishing their contributions to American society. Needless to say, telling the difficult story of slavery can be … difficult. At James Madison’s Montpelier, a new exhibit called “The Mere Distinction of Colour” documents the stories of the enslaved individuals who lived at the plantation and parses Madison’s complicated relationship with slavery. It also explains how the legacy of slavery persists today—especially regarding its place in historic retellings. “The Mere Distinction of Colour” represents a shift in the way we talk about slavery at historic places. This shift was made possible in large part by the Montpelier Descendants Community, descendants of enslaved individuals who once lived at Montpelier. 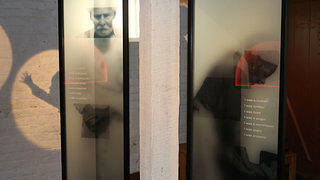 This group engages with the site in several ways, including its interpretation of exhibitions and programs. The exhibit is also effective because of the considerable amount of time and resources the Montpelier Foundation has dedicated to archeological studies into the lives of the site’s enslaved community. Through a combination of found artifacts and written testimonials, historians at Montpelier continue to uncover intimate details about everyday life for enslaved individuals in the 18th and 19th centuries. 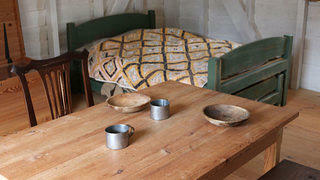 Inside a copy of a slave dwelling are some objects enslaved people may have used in their day-to-day lives. 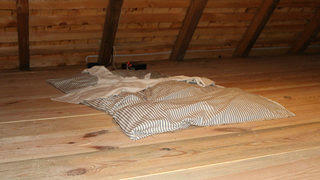 A simple mat in a loft above the tiny cabin would have made a bed for a child. 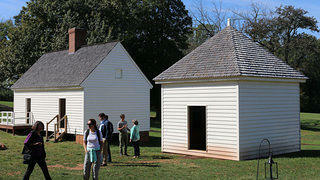 Visitors outside copies of slave dwellings near the Madisons' home. “The Mere Distinction of Colour” displays objects found at slave dwellings on the property to show that the enslaved community had lives outside of their enslavement. A bone or ivory chess piece, for example, means that some people living on Montpelier either enjoyed playing the game or may have traded the pieces for other goods. Slates and chalk found at the site show that many people were most likely literate, even though reading and writing was illegal for enslaved individuals in Virginia by 1832. The enslaved community owned objects they purchased themselves with money made from trading goods or working outside of their typical duties. They had families, friends, coworkers, hobbies, interests, and—most importantly—unique identities. Detailed accounts from the Madisons give us anecdotes into the lives of specific enslaved people—for example, Billey was James Madison, Jr.’s manservant in Philadelphia between 1780 and 1783. From Madison’s writings, we learn that Billey may have become fascinated by the independence movement gaining traction at the city in the late 18th century. Madison writes that “his mind is too thoroughly tainted to be a fit companion for fellow slaves.” But Madison didn’t sell Billey further South, where conditions for enslaved individuals were considerably worse. Instead, he sold Billey into indentured servitude in Philadelphia; Billey worked there for five years before he died, using his full name—William Gardener. Historians can’t say for sure what effect being sold in Philadelphia might have had on Billey, but by using archeological and historical evidence, “The Mere Distinction of Colour” attempts a guess. And this is the case with many of the other named enslaved individuals at Montpelier: the stories of Ella, Moses, Sukey, Anthony, Pompey, Turk, Dido, Paul Jennings, and other people are shared throughout the exhibit. "The Mere Distinction of Colour" uses Montpelier's basement to tell the full story of the enslaved community there. Even though visitors only have access to a few snippets of their lives, they are prompted to ask questions that give enslaved individuals’ identities additional context and resurface their humanity—how they may have felt about a certain situation; interacted with other enslaved individuals and the Madisons; or experienced life in general at Montpelier. And guests learn even more about their experiences through Montpelier’s Enslaved Community tour. Offered alongside the site’s Signature Tour, Montpelier’s Enslaved Community includes a look at several copies of dwellings on the plantation’s grounds. James Madison's temple on the hill is currently under construction. At the close of the Enslaved Community tour, I visited James Madison’s famous temple on the hill. Although the temple looks pristine from its exterior, underneath it was an ice house the Madisons used to preserve their meat throughout the year. Enslaved laborers had to lug ice from a nearby pond up the hill in winter and store it beneath the temple’s floor. In the summer, despite the ice, the meat stored underneath the temple tended to rot and decay. Madison never used the temple as a place of reflection—perhaps, my tour guide suggested, because he was ashamed of the rotting truth hidden beneath the temple’s beautiful facade. Montpelier’s Enslaved Community tour and Signature Tour create explicit connections to “The Mere Distinction of Colour.” James Madison’s life and legacy is deeply entwined with the lives of enslaved individuals; the ideals of freedom and liberty that he and the other Founding Fathers stood for contradict their personal choices. 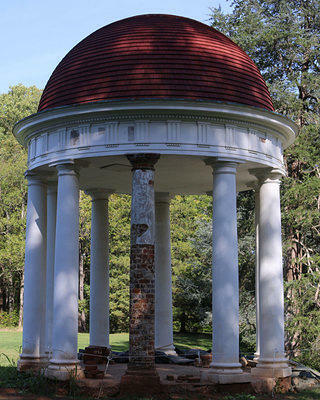 The staff at Montpelier ensure that visitors understand how foundational understanding the site’s difficult history is to understanding James Madison. “The Mere Distinction of Colour” broadens this connection to include a fledgling America, and the ways that slavery was embedded into our country’s government and Constitution without once being overtly named. The exhibit culminates with a powerful video that reinforces these connections—between the enslaved community and James Madison, between Madison and our country’s early history, and between our past and our present. The Montpelier Foundation invited 15 black academics, artists, and activists to the site over Martin Luther King Day weekend to create an interpretive video that encompasses slavery’s legacy. It might seem more comfortable to ignore or soften retellings of slavery’s difficult history and its significant impacts on the lives of African Americans today. But the “Mere Distinction of Colour” chooses to instead create an inclusive interpretation of slavery that addresses tough questions about where our national identity currently stands. Interpretation at Montpelier, owned since 1984 by the National Trust, has incorporated stories of the enslaved community since at least 1997.